The 47-year-old author of books including "Mystic River" and "Gone, Baby, Gone" is offering a monetary reward and has said he'll name a character in his next book after whoever finds Tessa. BROOKLINE, Mass. — There’s a new mystery on Dennis Lehane’s mind, but the story isn’t something the best-selling author can control from behind a keyboard. The plot kicked off Christmas Eve, when the crime novelist’s rescue beagle Tessa escaped from his yard after an outdoor gate latch didn’t lock all the way. Since then, Lehane’s family has launched an all-out search. They’ve posted fliers, organized foot searches and used social media to try to bring Tessa back to their home in Brookline, Mass., near Boston. The 47-year-old author of books including “Mystic River” and “Gone, Baby, Gone” is offering a monetary reward and has said he’ll name a character in his next book after whoever finds Tessa. Lehane said Thursday outside his home that he’s surprised by the media attention the story has attracted, and thinks it has something to do with the character offer. But he said as word of the missing dog spread, his family has heard from people across the country on a “Finding Tessa” Facebook page. They even got an offer of help from a dog psychic in San Francisco. “No dog since Lassie ever got this attention … the flip side of the comedy is, who wouldn’t do this for their dog?” he said. 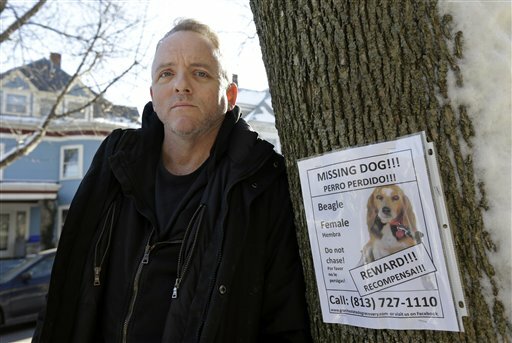 The doggie dilemma comes as Lehane faces a Friday deadline for finishing a movie script based on his short story “Animal Rescue,” timing he said may be “sadistic irony.” The movie is scheduled to begin shooting in March in New York City. The author said he’s been spending about four hours a day searching for the tri-colored female beagle after he finishes writing, and his wife has dedicated about 10 hours a day to the effort. They adopted the 4-year-old beagle not long ago from a Florida rescue agency. Before that, Tessa was a stray in Georgia. With the help of Twitter and Facebook accounts, Lehane and his wife organized two search efforts Thursday in sections of Brookline and Boston, where they suspect Tessa could be. In the beginning, there were three sightings within about two miles of their home not long after a house sitter reported that the dog was loose. But the trail went cold for days after a sighting near a McDonald’s restaurant. Tessa wasn’t wearing tags, but does have a microchip. Missing dog posters dotted the family’s Coolidge Corner neighborhood Thursday, including in the front windows at Durty Harry’s dog grooming shop where Tessa is a client. Shop owner Michelle Fournier said interest in the search took off even before people knew Tessa had a famous owner. “This is about a dog and her family. This is about a community who loves dogs,” she said. Lehane said Thursday that Tessa is so sweet that she’d taken to spooning the family’s puppy before her disappearance. He said if someone knows where Tessa is, he only cares about a happy ending, not about solving the mystery of where she’s been.